Cycle in more than 30 years. 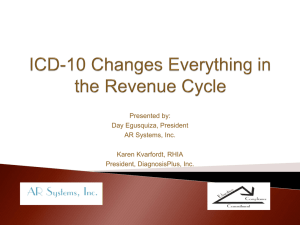 using ICD-10 or modifications in 1994.
illnesses, injuries in a healthcare setting). HIPAA for uniform claim submission. Computer will not accept lower case. 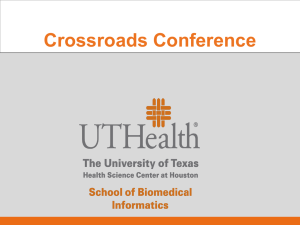 coding and medical necessary codes & denial software. accept both ICD-9 and ICD-10 on the UBs post go live. pre-certifications and concurrent review with ICD-10. areas are ready. A team leader or leaders are identified. 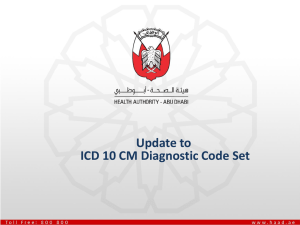 and descriptions will have to be translated to ICD10-CM versions. of claims for providers of laboratory test services. 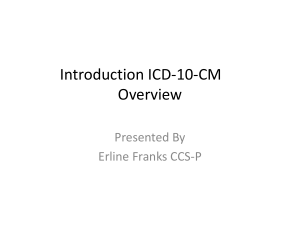 ICD-9-CM as well as ICD-10-CM and ICD-10PCS at the same time? Cheat sheets in each dept! 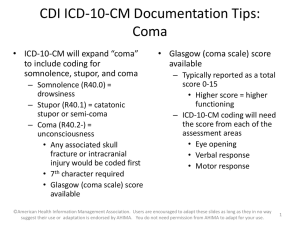 Hospital inpatient procedure code set changes from ICD-9CM (Vol. 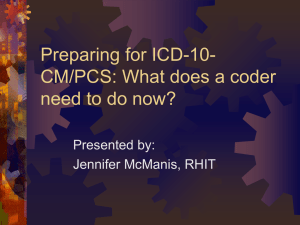 3) to ICD-10-PCS. 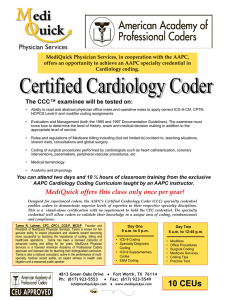 No impact on CPT and/or HCPCS codes. outpatient services including physician visits to inpatients. version 5010 (claims, eligibility, authorizations). 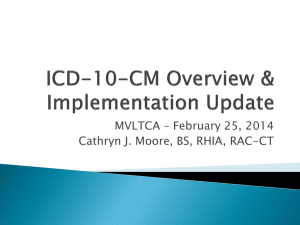 implementation of ICD-10-CM and ICD-10-PCS. 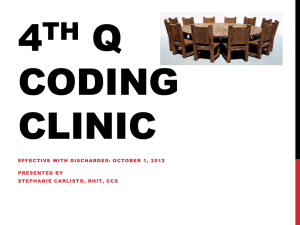 IP date of discharge on or after October 1, 201x. OP date of service on or after October 1, 201x. No grace period and/or extension per CMS! to capture new technologies and diseases. ◦ 10,582 (62%) of fracture codes to distinguish ‘right’ vs.
chapters, no longer part of Nervous System chapter. common fourth and fifth digits). Post-op complications have been moved to procedurespecific body system chapters. treatment or is it for routine follow-up? straight correlation for others, i.e. OB. GEMs are a tool to convert data. code(s) to identify abnormal findings”. there is only one code”. unspecified code may no longer be necessary”. includes 10 choices for acute bronchitis”. 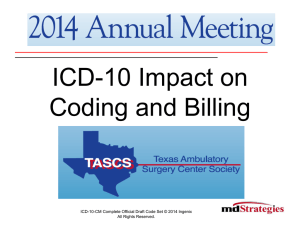 implementation of ICD-10 will exceed $130 million. beds, to $500K to $2 million for 400+ beds. coding may need to occur as well as OT. documentation patterns for providers and care givers. Potential salary adjustments for the coders. Down time during training and practice time. The time is NOW, if you have not already started! 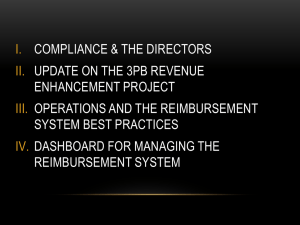 managed care contracts, data, reports. a designated project leader need identified? assessments with barriers, delays, more education, etc. 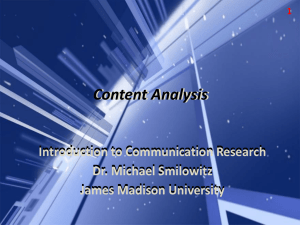 education –based on type of pt. 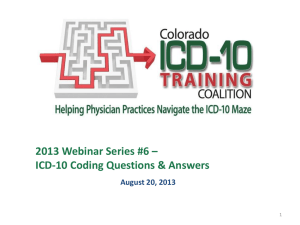 ICD-9 prior to Oct, 2013.
implementation of ICD-10 (or less anguish). for compliance and when they will be ready to test. they are available for testing. testing 9 months prior to go live. 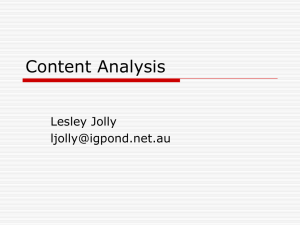 year – risk assessments of current documentation practices. 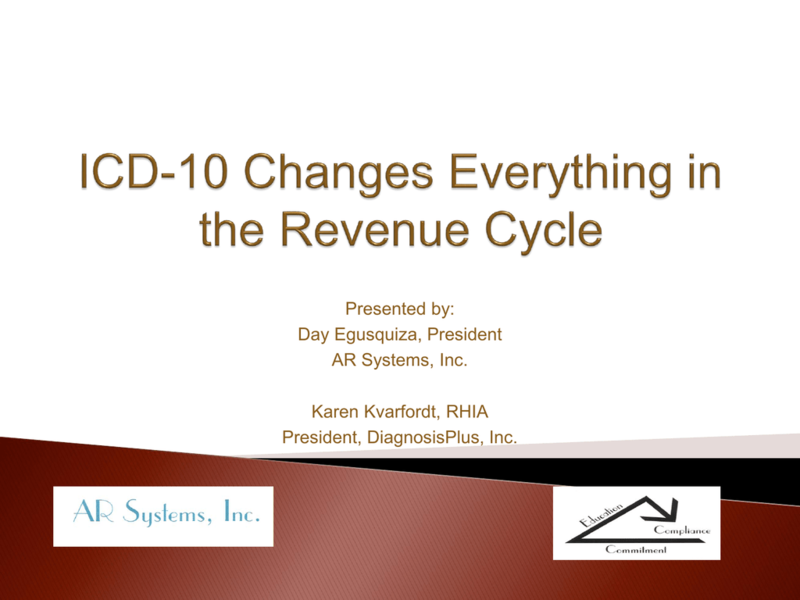 support the ICD-10-CM principal diagnosis code. coders? Who will handle the coding of ‘prior to’ accounts vs.
‘go live’ accounts? Possible concurrent coding? Remember, we are ALL in this together!! 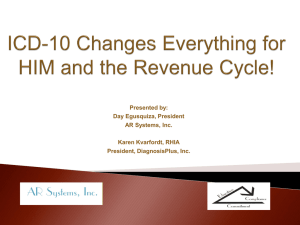 required based on the specific AHIMA credential(s).  18 for the CCS credential, etc. THANKS A TON! We are having fun now! code assignment and MS-DRG assignment. your docs as well to support the codes. HAS to be there in the medical record. numerical codes, which generates the bill/claim. not stated, it cannot be coded! Laterality (side) i.e., left or right – 25,000+ codes! lost a lot of blood, also from the right leg. severity of the soft tissue damage. with varying degrees of fragmentation. of diagnoses as documented in the medical record. that will be generated from ICD-10. document one way or another. 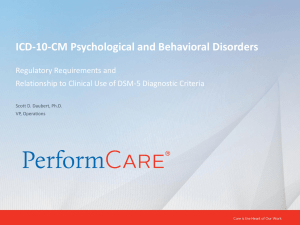 medical record – physician addendum. Track and trend for patterns. Then do more Ed! caregivers on weak or incomplete documentation. delay in coding = delay in cash. result in a lower paying MS-DRG. training of the coding staff. 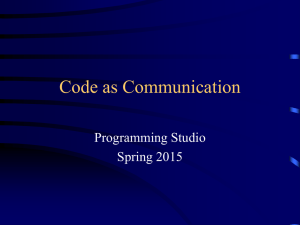 code, i.e. excision vs. resection. 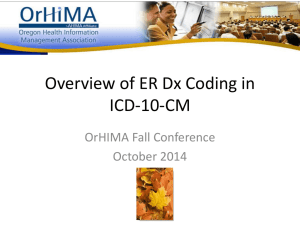 Preparing for ICD-10 - is on www.oregonhfma.org.